That the frightening fire broke out during Easter Week is cruel irony. The flames that stabbed the Paris sky Monday evening did more than ravage the Notre Dame Cathedral, one of the world’s most famous edifices. The frightening glow emanating from a place that has endured more than eight centuries of turmoil pierced our sense of permanence, and left us all utterly unnerved. Notre Dame’s sheer size was meant to inspire, to force one’s gaze upward, to foster in its patrons the humility of being confronted with something greater than themselves. It took 100 years to build, beginning in 1160, an icon of Gothic architecture that became a treasure not only for France but also all mankind. As Paris grew and changed, its cathedral remained its immutable center. And it was so much more than a place of worship. With its soaring grace and peerless beauty, Notre Dame served as a testament to human ingenuity and imagination. So the world watched helplessly as fire felled the cathedral’s steeple. Most of the interior is presumed destroyed. 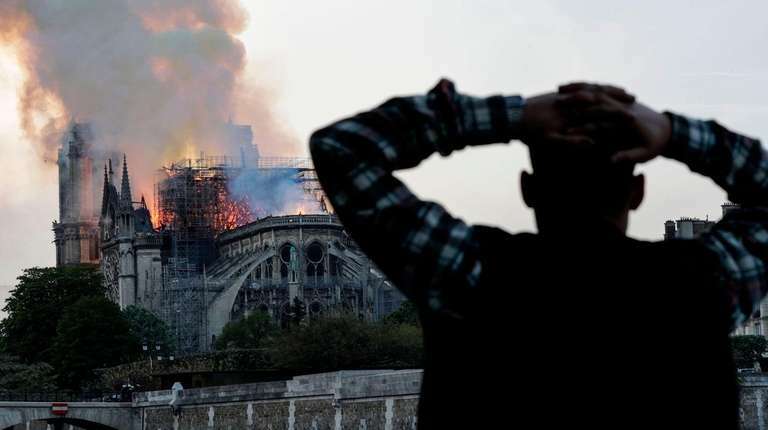 The feeling of loss will linger, whether one remembers the glorious rose windows, the frescoes, the sculptures, the magnificent organ, the stone gargoyles, the distinctive flying buttresses, the view of Paris from high atop the south tower, or the mesmerizing sight of the cathedral bathed in light at night. Notre Dame has struggled before. Its treasures were damaged, stolen or destroyed before and during the French Revolution. In the 19th century, the spire itself was replaced. When Paris was liberated in World War II, the celebratory mass was held in Notre Dame. As it burned Monday, millions around the world mourned as they shared their memories and searched for photos. The cathedral was in disrepair. That the fire might be linked to ongoing renovation work being done on the spire spoke to human fallibility. That it broke out during Easter Week was cruel irony. This is the most solemn time of the year for Catholics, but the somber events marked by the faithful conclude with a message of rebirth and resurrection. We wish that now for Notre Dame.